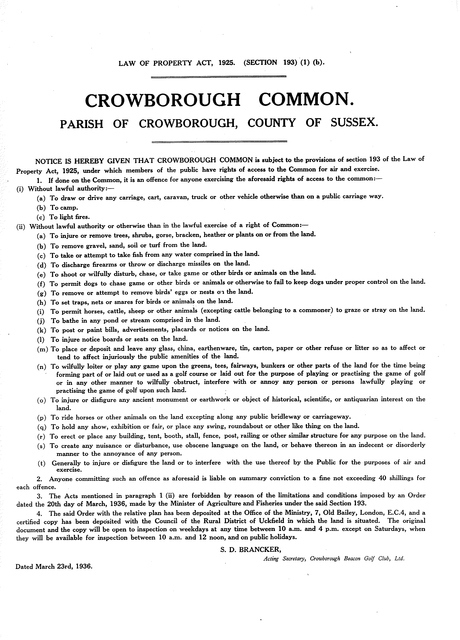 Crowborough Common has been in the ownership of Crowborough Beacon Golf Club Ltd, since 29th January 1906. Previously owned by the De La Warr family, for the full history of the Common go to the Manor of Alchorne page. On 20th March 1936, the Golf Club entered into a Section 193 Agreement under The Law of Property Act 1925 which gave various rights as shown on the original document (click to enlarge). As owners of the freehold title, the Golf Club served notice to DEFRA on 1st February 2013 to revoke the Section 193 Agreement which governed the public’s rights to exercise on The Common with immediate effect. DEFRA confirmed the revocation of the rights on 7th February 2013. There is no "right to roam" over the golf course. Under the CROW Act people can walk, responsibly and subject to some common sense restrictions, over areas of open country and registered common land in England and Wales. These areas are included in the access land shown on OS Explorer maps and on the CROW Access Maps website. The legislation only provides a new right to walk over ‘access land’. ‘Access land’ is land that has been shown by the Countryside Agency on conclusive maps of open country and registered common land, or land that has been voluntarily dedicated for CROW access. It excludes excepted land and CROW Section 15 land. Excepted Land has been established as a common sense approach to help safeguard privacy and avoid obvious land use conflicts. The CROW Act required the Countryside Agency to show all land on the statutory maps that is open country or registered common land. However, Schedule 1 to the CROW Act identifies 13 categories of land that, because of their location or use, are excepted from the right of access. There is no right of access to excepted land regardless of whether or not it is included in the yellow wash on the access maps. The categories of land were selected to help ensure that the right of access is exercised with consideration for other people and that the public are not placed in positions of danger. Such areas will usually be easy to spot on the ground, although they will not necessarily have hard boundaries. DEFRA has produced guidance to help people identify and respect excepted land when out walking. Landowners can put up signs to indicate excepted land, as long as the signs are not misleading. Because the East Sussex common land register was destroyed by fire in 1993, the Countryside Agency was unable to show registered common land in East Sussex on its map of open country and registered common land for the South East area. Following reconstitution of the register, a decision has been made to map registered common land in East Sussex at the same time that the conclusive map for the South East is reviewed. 5. The "right to roam"
This is a commonly-held misconception, often perpetuated by the media who use the phrase 'right to roam'. It does not mean people can go wherever they want. There is no "right to roam" on a golf course. “No, although the Countryside and Rights of Way Act creates new legal rights of access it does not give blanket permission to walk wherever you want. The new Act will give people access to over four million acres of mountain, heath, moor, down and common land throughout England and Wales. The Countryside Agency and the Countryside Council for Wales will draw up maps which will show the new rights of access. It is being brought in gradually and in some places it is already in force. See website in related information for details of the area you live in. Additionally the new ordnance survey maps will show new rights of access which will be distributed locally. There are responsibilities and restrictions that come along with the Act. It does not allow, amongst other things, camping and organised games, damaging plants and animals, dropping litter and lighting fires. Regrettably accidents and injury do occur on golf courses and there is already established case law of successful litigation claims and damages for injury running into hundreds of thousands of pounds. The most recent case being Phee v Gordon in 2011. A much earlier, yet remarkably similar case was Pearson v Lightning in April 1998. Although both cases contain almost identical facts, and similar injuries, involving the permanent loss of eyesight, only Phee v Gordon places any liability on the golf course operator. The statute relied upon in this case, the Occupiers Liability Act 1957, does not go so far as to place a responsibility on the golf course operator to stop a claimant making a conscious decision to run a risk. Therefore, if a claimant is knowingly taking a risk the golf course will not be held liable. It does not prevent them from being held liable for risks generated by the action of a 3rd party which make the course unsafe for a claimant. In any event the duty only extends as far as to take reasonable care for the claimant’s safety. The most recent case highlights the risk a Golf Club would take if it continued to allow members of the public to roam freely in areas where danger is likely. An even more recent and again, similar case, is currently going through the Edinburgh courts in February 2013. Over the past few years we have seen the pedestrian traffic increase on the golf course, particularly the playing areas of the golf course. The risk of injury to the public has therefore increased quite considerably. It is the Board of Directors of CBGC who must take the responsibility and risk. No consultation can relieve them of their responsibilities. If someone is seriously injured, neighbours and the public at large will not be accountable. Without the legal right to walk on the golf course other than on designated footpaths or bridleways, establishing negligence or liability will become far clearer. It would be highly likely that a member of the public walking on parts of the golf course which were not official Rights of Way, would be deemed negligent. Whilst the Golf Club carries significant Public Liability cover, as do most golfers having their own Personal Public Liability Insurance, in the case of a personal accident claim there will always be a question of negligence to be established, and increasingly this will most commonly be decided in a Court of Law only after considerable expense. Whilst the Section 193 Agreement was in force, the question of liability and negligence would most likely be a very difficult decision to establish. © Crowborough Beacon Golf Club, Crowborough, Sussex.